A wide range of climates which occur over Northern Eurasia predetermines a variety of river regimes. Following Zaykov (1946) it is possible to distinguish ten major types which are given in Figure 5.6. Because of the strong climatic seasonality, most rivers of Northern Eurasia are characterized by a highly uneven annual distribution of runoff. The spring flood regime prevails across most of the territory. The spring water levels are especially high on the rivers draining more southern catchments (i.e., in the mixed forest, forest-steppe, and northern steppe zones). Further north, snow melt is a crucial control (although in the tundra and taiga, snow melts at a much slower rate) and other factors, such as rainfall and ground water, are also important. Therefore, the difference between the spring and the summer water levels is less pronounced. A specific regime develops on the rivers draining the permafrost areas (the East Siberian type in Figure 5.6). In winter, water gain often ceases completely, including the seepage of ground water, and the winter levels in such rivers are extremely low. With air temperatures being often below -40°C, it is not unusual for the rivers of north-eastern Asia (including such large rivers as the Indigirka, Yana, and Anabar) to freeze through to the bottom. In the mountainous regions summer peaks are typical and on the Pacific coast monsoonal precipitation accounts for the late summer — early autumn peak. The humid environments of the tundra and the boreal forests are characterized by the relatively low inter-annual variability in runoff which increases in the arid regions. While in the forest zone of European Russia the coefficient of variation of mean annual runoff fluctuates between 0.2 and 0.3, in semi-deserts it exceeds 1.2. The coefficient of variation is usually low in those regions where lakes and swamps are widespread. Many studies, based on long-term records and analysis of sediments, have shown that longer-term fluctuations and periodicities in runoff exist (Shiklomanov and Markova, 1987). 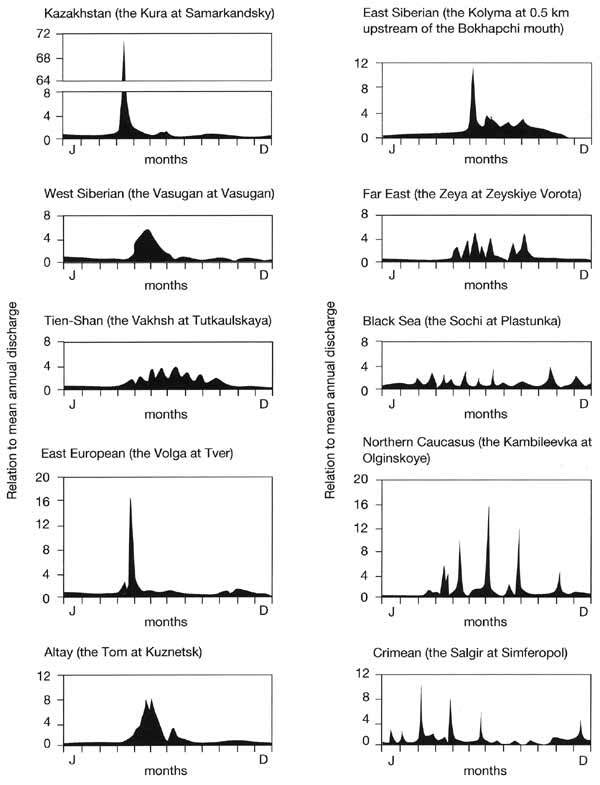 For example, a hundred-year cycle in variability of the Dnieper runoff has been found by Shvetz (1978) within the 3800-year period on the basis of the analysis of silt deposits in Lake Saki in the Crimea. However, the greatest attention has always been given to the runoff fluctuations in the Volga. The low values of water discharge in the 1970s and a drop of the Caspian level prompted the development of projects concerned with water diversions from the northern rivers. Higher levels of runoff resumed in 1979 and were followed by a rise of the Caspian level and flooding of some of the adjacent lowlands (see below).